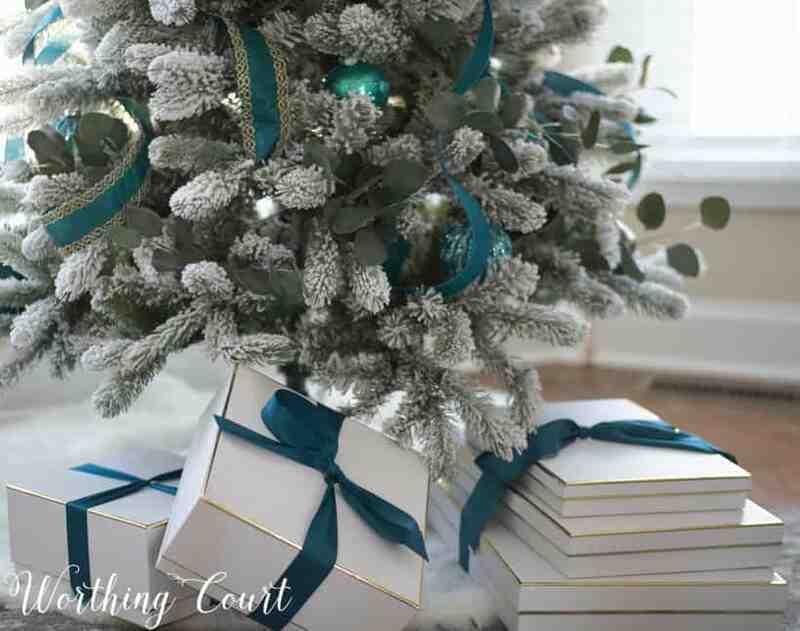 Simple decorating ideas for a flocked Christmas tree. 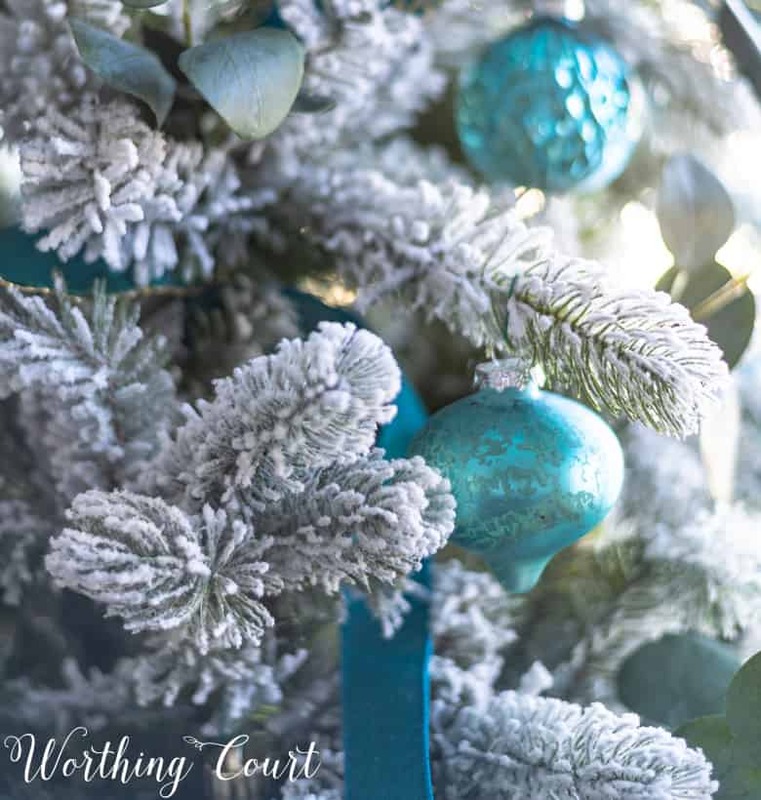 The fullness of a flocked tree is beautiful on its own, so only the simplest of decorations is needed to create a stunning Christmas tree. I’m so excited to share my first ever flocked Christmas tree with you! This beauty was sent to me by King Of Christmas (see my disclosure HERE) and my pictures do not do it justice! My tree is the 7.5′ King Flock Slim With Warm LED Lights. If you’ve ever considered purchasing a flocked Christmas tree, the investment in a tree from King Of Christmas is SO worth it. Their trees are available in both flocked and un-flocked, with lights and without, from 6′ to 15′ and in a slim or regular profile. 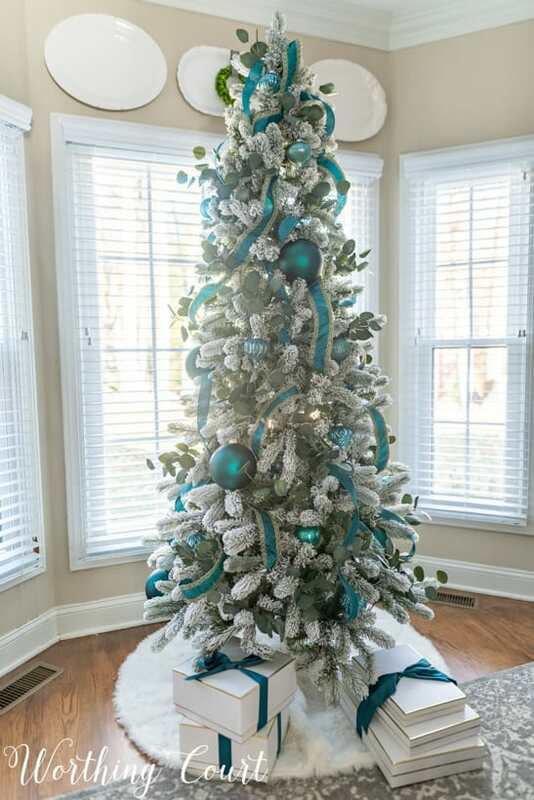 Even though I would have been happy with no decorations at all on the tree, I was inspired to add two types of teal ribbon and a small amount of teal ornaments. Once I added ribbon to the tree, one box of twelve frosted and shiny glass ornaments and few large solid frosted teal ornaments were all that the tree needed. It’s so full and has a beauty all its own! 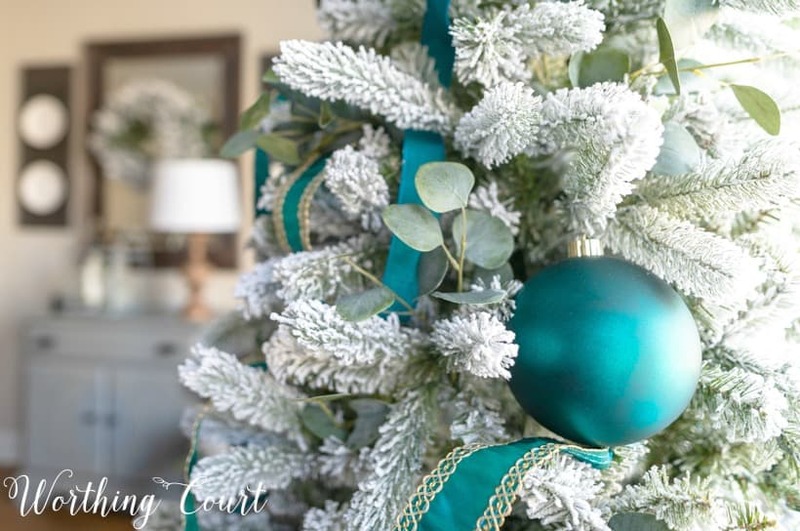 I love the sagey, bluish/green color of eucalyptus mixed with teal, so to finish the tree off and to add a bit more interest, I cut apart a few bushes of artificial eucalyptus and inserted them into the branches of the tree. 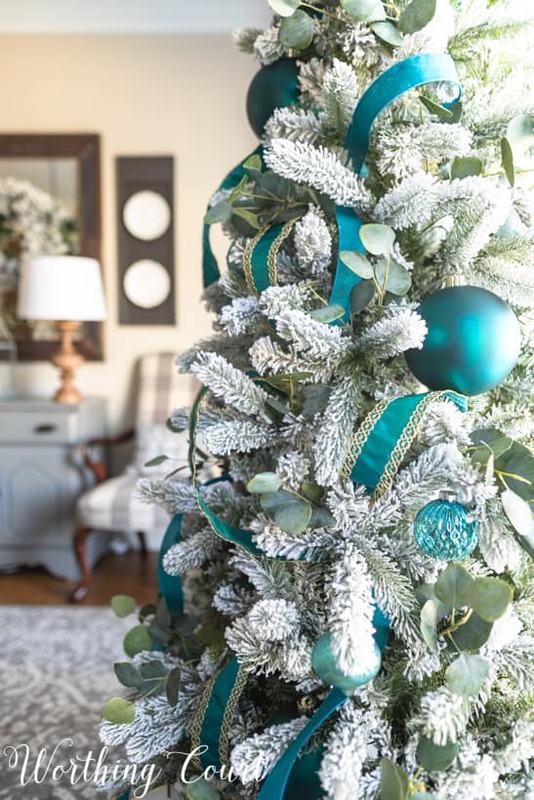 One fear I’ve always had about flocked trees is that they shed an enormous amount, but I can honestly tell you that this tree shed very, very little through the setup process, through fluffing all of the branches and through decorating the tree. I have some small, inexpensive flocked tabletop trees that shed like crazy when you touch them, so I’m guessing that less expensive full size flocked trees would do the same thing. 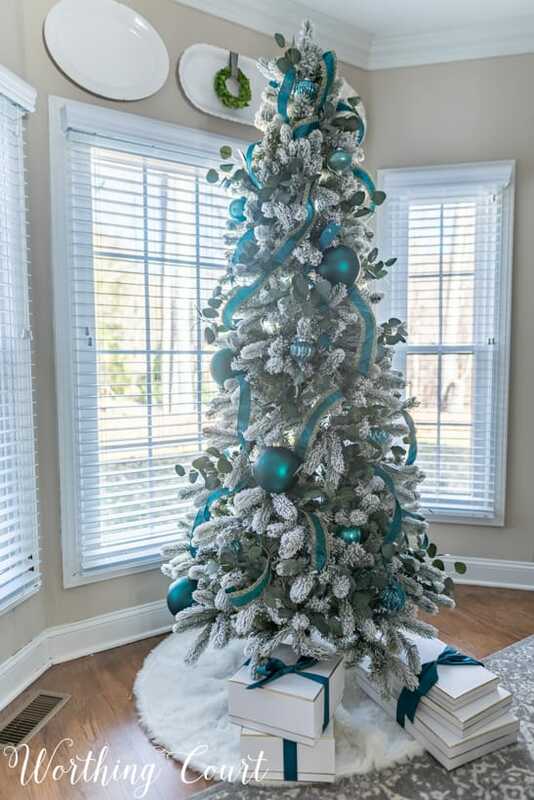 I believe that the lack of shedding coupled with the ease of assembly and the fullness of the tree definitely speaks to the quality of the tree and make it well worth the investment. This is one product that you won’t be disappointed with! I love it! 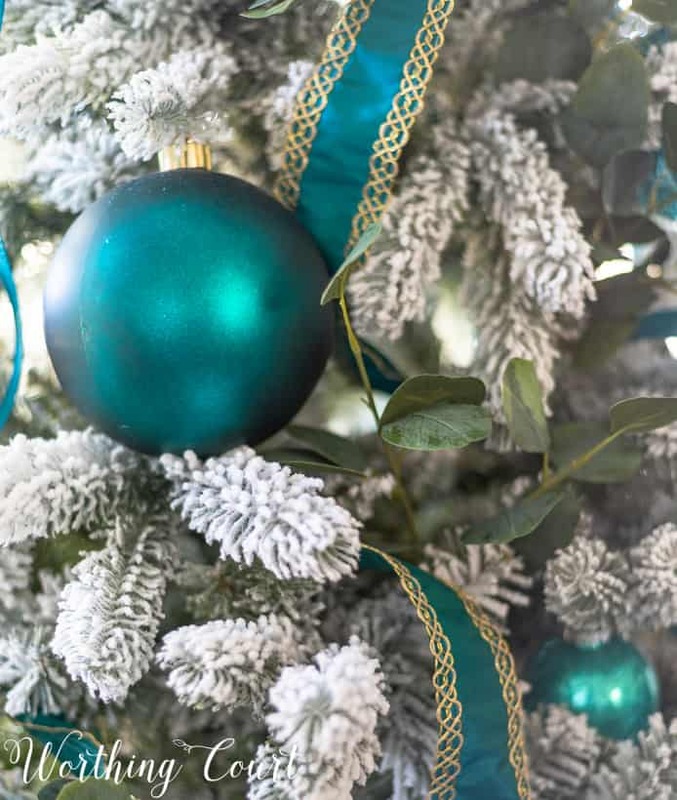 Where did you find the teal ornaments? Thank you, Melinda. I found the teal ornaments at At Home. It’s beautiful Suzy!! I LOvE it! One of the prettiest trees I’ve seen posted all season! Truly gorgeous! Oh, goodness – thank you, Shandra!